The other day my son said to me defiantly, why do I have to read? Reading is so boring. I like doing fun stuff. Who wants to sit on a couch and read an old, stuffy book. Not me! Being a diligent mother, I tried to explain to him the importance of reading. How the abilityeader can help him in school, work, and life in general. Unfortunately, a small child wants fun, not a lecture on the importance of life goals. So, my solution to his reading complaint is to find fun reading apps for my iPad. My goal is to get him to read while having fun. In this scenario, we both are happy campers. One good iPad reading app is the Joy Tales. What I like about this app is that there are 12 orginial stories in this series. With additional stories, the app can grow with your kids. 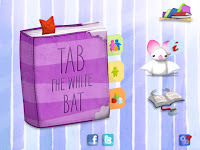 The first story that is available is called Tab the White Bat. 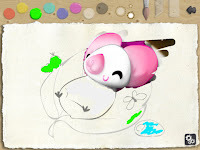 The story chronicles a little white bat who is different from all the other bats in the castle. Through his journey, Tab discovers that being different is a good thing as do the other bats in the castle. There are several things that I like about this app. First, the story can be read to you or you can read it independently. Second, on the read to you option, each page has an interactive detail. From bats flying to nightly creatures that appear, kids can tap the screen to make the images come to life during the story. In addition to the story, the app offers several play options. From a matching game to connect the dots and even a drawing feature, these play features can act as a reward for reading. The more my kids read independently; the more my kids can play. The most unique feature of this app is that you can record feature. With option, you can record yourself reading the book. I would love to use this feature with my kids' grandparents. Now papa can read a bedtime story any night, not just while we visit on vacation. Tab the White Bat is the first book in the series of Joy Tales. Additional books will become available. To add this app to your iPad, please visit the app store to download Joy Tales. Currently it is free. Disclosure: Occasionally I am compensated for my reviews of certain products. All opinions are mine and have not been influenced by any person or entity.